"The idea of this book is to enthuse beginners with an account not just about how to get started in this brilliant game, but also containing some of the great characters, stories and photographs from backgammon, something I don't think the current much more technically proficient books out there have included. "Firstly it is clear that the book has not been proof-read by an expert or even a competent player. If so they would have picked up the many very basic errors including: wrong diagrams, wrong solutions, invalid solutions, duplicated diagrams, duplicated sentences and historical errors. I find it hard to believe that the publishers couldn’t have picked up some of these very basic mistakes. As a simple example I am quoted as defining a basic safety rule in bear-offs. I would love to have been the first to document it but that was actually done some 40 years ago. The main problem with the book is that it is written by someone with just enough backgammon knowledge to sound credible some of the time but there are conceptual errors that make it incomprehensible in places. The author frequently equates match equity with game equity throughout the book  he never defines the difference between money play and match play  which made it hard for me to understand so it would be even worse for a beginner. He doesn't seem to understand simple probability  fanning three times on a two-point board is quoted as 200,000 to 1 rather the actual 729 to 1 and there are other examples. Terms are used before they are defined and some, for example 'rollout', are never defined. One of the things that I learnt when writing both Dummies and Backgammon to Win is just how precise you need to be in terms of sequencing information. There is one position, used to illustrate a point, that I don't think could occur naturally in a thousand years, if ever, and is utterly confusing. Finally you need to read the book in good light because of the font size which is too small and also some of the photos can't actually be seen easily due to low quality. Chaper 1: Chimp, Chump or Champ? COVER: Packed with examples, photos and anecdotes, this book combines professional experience with humour to offer the backgammon 'loser' an accessible guide to winning. The content has been tecchnically edited by Phil Simborg, a world-renowned professional player and teacher. 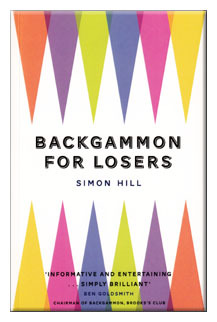 AUTHOR: Simon Hill has done his fair share of losing at backgammon before going on to play at international level, as a member of the UK team at the European Championships in Budapest and in the individual World Championships in Monaco. When not playing backgammon Simon runs a business, London Place, and lives in London with his wife, Trish, and their three children.